At Goodall Pools & Spas, we believe taking care of your pool should be easy and convenient. We carry pool equipment that is efficient, as well as easy to maintain and operate. We are authorized dealers for Hayward and Pentair Pool Products. 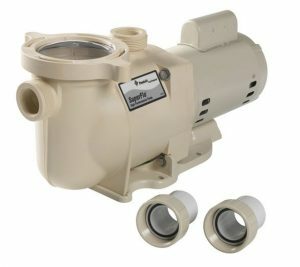 We carry single speed and variable speed pumps for a variety of pool sizes. A variable speed pump can help save up to 75% of your original pumping bill according to ENERGY STAR. We can also use an energy calculator to estimate your savings by switching from a single-speed pump to a variable speed pump. One of our local power companies is even offering a $350 Rebate if you replace your old single-speed pump with a variable speed pump. If you are looking to replace your existing filter, we can help you out! Whether your old filter is sand, cartridge, or DE, we can help you find the best new filter for your pool. Cartridge filters are a great option for saving time and money. Unlike sand and DE filters, cartridge filters do not waste water or create a huge mess when backwashing. They provide the best overall performance, convenience and value. If you’re looking to extend your swim season in the spring and fall, we have heaters and heat pumps available as well. Pentair is currently offering a $200 rebate on their energy efficient UltraTemp High Performance heat pump. A heat pump can easily add a few extra weeks to your pool season, and they provide a significant savings in energy costs over gas heaters. We also believe cleaning that your pool should not be a time-consuming hassle. If you are tired of hooking up a 35-foot hose to your skimmer and vacuum head every time debris ends up at the bottom of the pool, we have a solution! We are proud to carry Maytronic’s Dolphin Active Series Automatic Pool Cleaners. Dolphin cleaners easy to use, and all the dirt and debris is collected inside of the unit, instead of taking the debris into your filter. You simply put the cleaner in the pool, plug the cleaner power supply into a regular wall outlet, and turn it on! The cleaner will work its way through the pool, picking up debris, and doing the work for you!